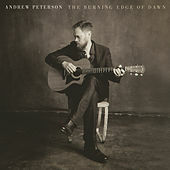 Andrew Peterson’s first album in three years is new in more ways than one. Rather than a group of songs collected along the way, many were completed in the studio to accommodate his busy life. That’s because he’s as much author as artist nowadays, and the imagery from his fantastical fiction creeps into his music like kudzu, winding its way through each track. It’s another layer added to his already multidimensional songwriting. At this stage in his life, Peterson’s youthful optimism has given way to a more reflective, ragged spirituality, but (thankfully) wistfulness and wisdom remain.